Considering that our birthdays are a week apart, my wife and I have a tradition where in lieu of birthday gifts, we go out for a nice meal where we splurge more than we normally might. Having tried many of the restaurants in Providence and not being able to make it up to Boston lately, we looked to try something new to us. After seeing a rave review from the Phantom Gourmet about Red Fin Crudo + Kitchen, I suggested to my wife that we give it a try because I knew she likes tapas. 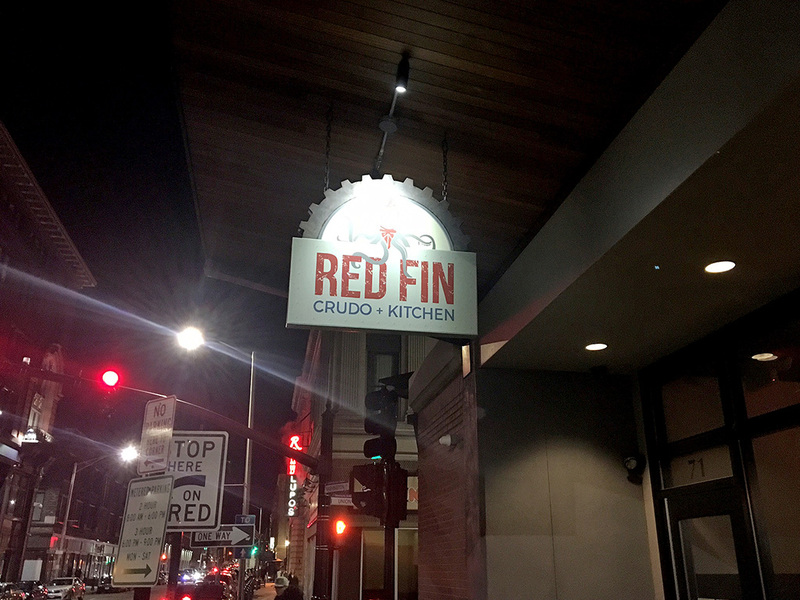 I learned that one of the owners, Jennifer Behm-Lazzarini, was a season 2 winner of the TV competition, Master Chef and that her husband, Julio Lazzarini, hailing from Puerto Rico incorporates much of what he’s learned from working in the business to Red Fin’s menu. We booked our reservation and went filled with mutual birthday excitement for our first night out since our son was born. 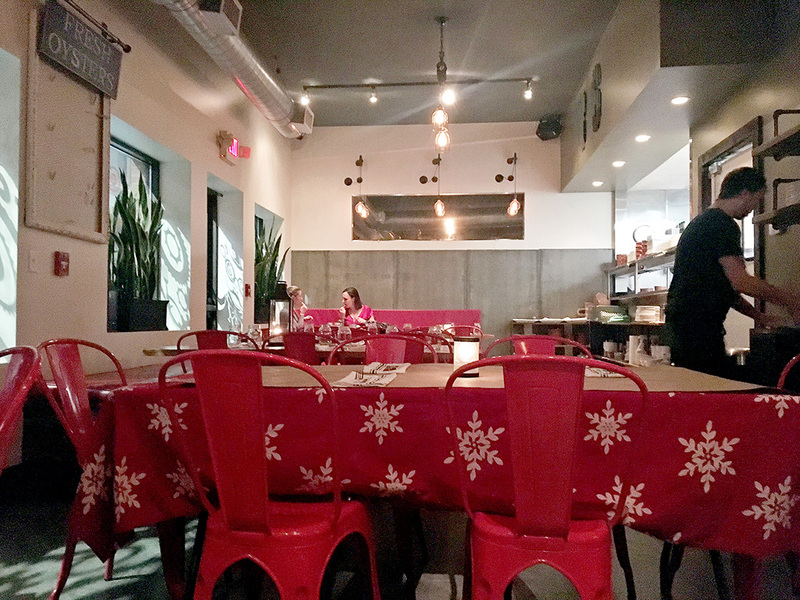 The first section of Red Fin Crudo is a bar area with some limited table seating. The colors are warm with reds and dim yellow lighting. The area in the back is exclusively casual table seating with colorful tablecloths and metal chairs. Our server was awesome, super friendly, and helped us decide on what to order (such as the Brussels Sprouts, which turned out to be the best thing we ate all night). He was also very accommodating regarding any concerns we had during the meal and comically sympathetic about the abysmal parking situation in downtown Providence when there are multiple big events in the city that can result in small businesses losing revenue when people can’t find parking (see below the almost empty restaurant due to cancelled reservations on a Saturday night!). The food at Red Fin Crudo has me torn a bit because for every appetizing hit, there was somewhat of a miss somewhere along the way as well. While all of the food tasted good, it was hard to enjoy it completely due to some preparation issues and the general price tag being a little high for the quality of the food we received. 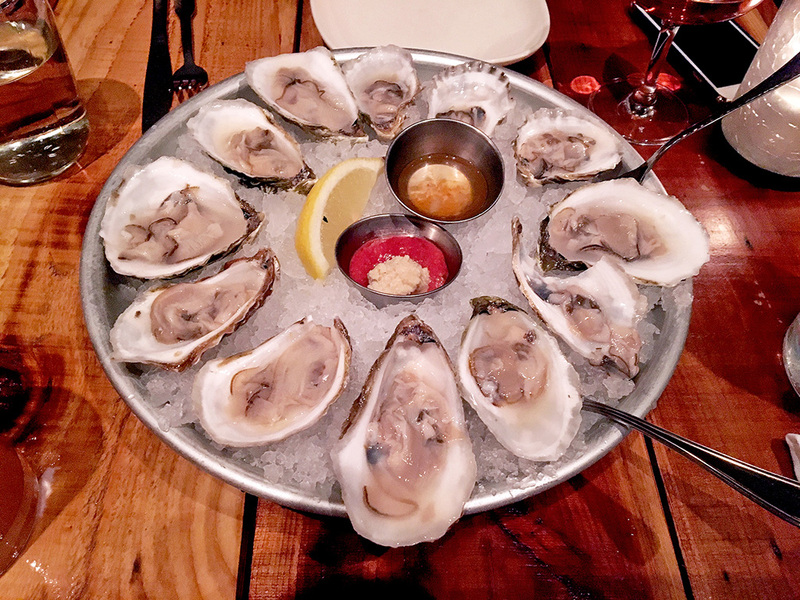 Oyster Sampler – My wife and I wanted to splurge for a special occasion so we went for the Oyster Sampler and the quality of the dozen oysters were admittedly superb. They were very fresh and I was particularly impressed with the house cocktail sauce as well as the mango mignonette that accompanied the oysters. The problem for me was that the oysters were horribly shucked. Easily 8/12 of the oysters had shell fragments in them that we had to spit out while eating carefully. Making matters worse, two of the oysters were legitimately shattered with shell fragments clearly visible in the meat. One particular oyster was even falling out of the remaining shattered 1/4 shell right onto the ice underneath. I had a hard time believing anyone would serve an oyster like that. I asked if we could get two replacement oysters for the ones that were really bad. Luckily, our server promptly took them back and brought us four new ones in place of the two, which was very nice. So all in all, great quality oysters with wonderful accompaniments, but terrible shucking and quality control. I expected much better for $30, but the service was good to address the issue. Luckily, they also have $1 oysters from 4-6pm every day. Rock Shrimp Ceviche Special – Ceviche is on the main menu, but on this particular night there was a special featuring rock shrimp ceviche. For anyone that doesn’t know, rock shrimp are often compared to the flavor of lobster due to the sweetness of the meat as well as the fact that they have an extremely hard shell compared to other shrimp. I was very excited to try this dish. Overall, the sweetness of the surprisingly tiny shrimp (not all rock shrimp are that small) came through and I appreciated that the ceviche treatment didn’t overpower the delicate flavors of the seafood with an overly tart citrus profile. The dish also came with corn nuts, which I found a little odd as a pairing both for texture and flavor. The other notable ingredients were shaved curls of cucumber encrusted with a really spicy rub. I liked the cucumbers as a pairing, but didn’t want to eat them with the shrimp for fear of losing the shrimp flavor. 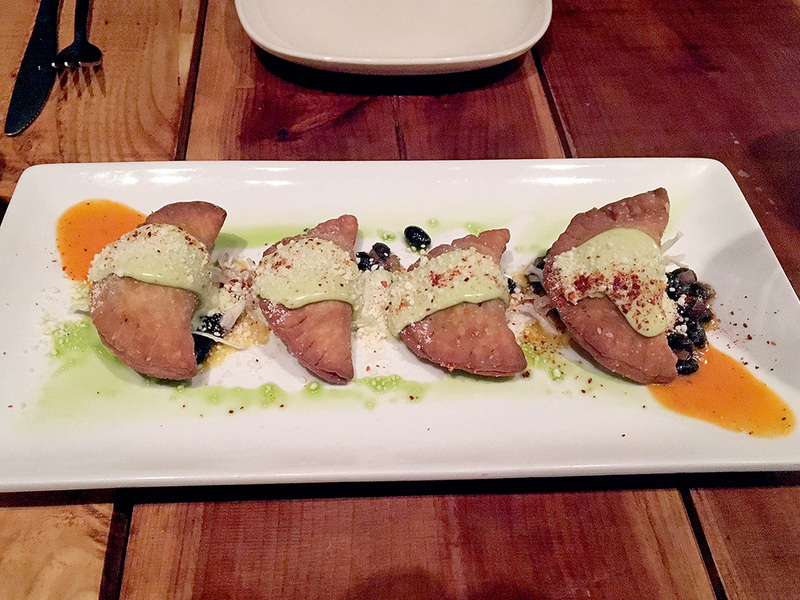 Empanadas de Picadillo – These tiny empanadas had some very good flavor. The outer crust felt like a light pastry crust in contrast to some cornmeal empanadas, but it definitely worked. The beef filling also had a nicely spiced flavor and tender texture, but they were a little on the small side. Overall though, this was probably in the top three dishes we tried at Red Fin. Paloma Cocktail – The menu offers a modest cocktail and beer selection. 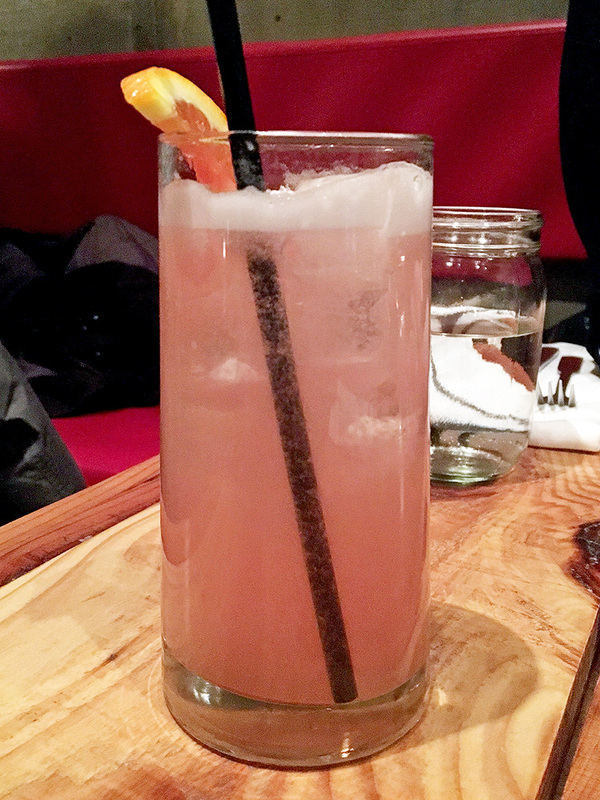 I tried their take on a Paloma, which I felt was fairly straightforward and had a nice balance of citrus flavors. I did, however, think it was a little on the weak side as not much tequila flavor really came through at all. 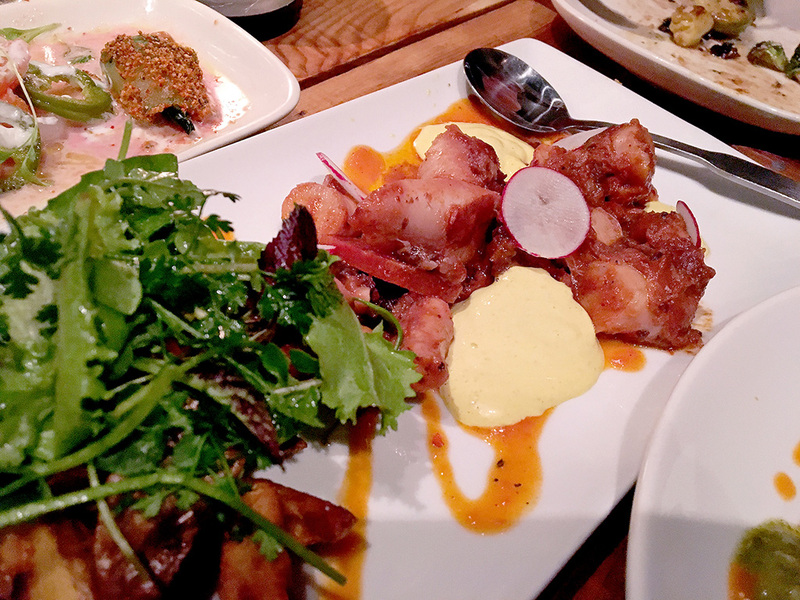 Spanish Octopus – I really enjoy octopus, so I was very excited to try Red Fin Crudo’s. The octopus came out sliced into cylindrical pieces mixed with smoked tomato and chorizo on top of a lemon aioli. A side salad of farmers greens accompanied the octopus on the same dish. As I tasted the first bite, I noticed immediately that the octopus was fairly tender demonstrating a sign that quite a bit of skill went into the preparation, which I respect. I also noticed, however, that between the smoked tomato and the chorizo, there was a familiar childhood flavor to the octopus. It sounds crazy, but the shape, texture, and smoky flavor of the octopus was reminiscent of sliced hot dogs with just a hint of the ocean – albeit much better. That left me a little conflicted about the dish because the skill in making it tender was there, but I’m on the fence about the pairing of the octopus with the heavy tomato smokiness and chorizo spices that covered up some of the natural flavor. Coles de Bruselas – As it turned out, the dish I was least excited about turned out to be the best dish of the night. These pan charred and crispy brussels sprouts mixed with bleu cheese and a sherry glaze were just awesome. 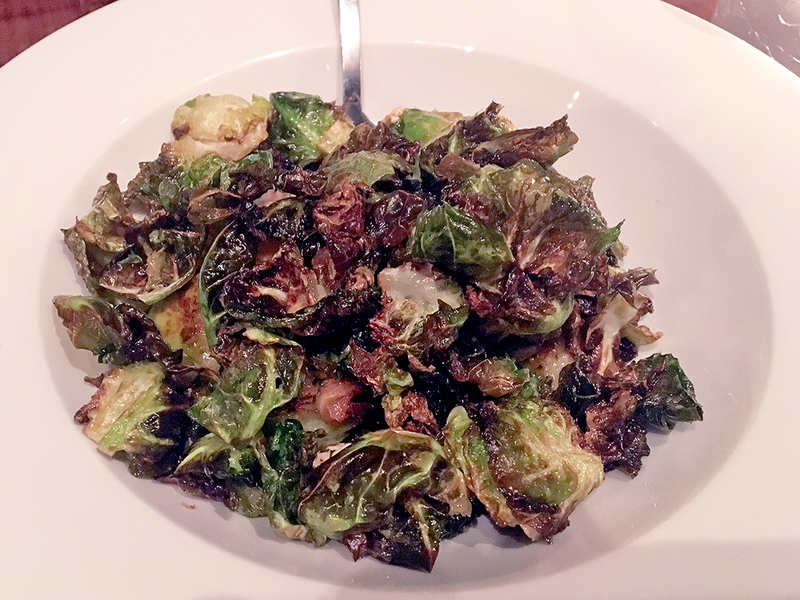 The crispy, charred, earthy leaves were perfect while the glaze acted as a bridge between the sprouts and the tangy bleu cheese bits. I appreciated that our server recommended this dish because it’s not necessarily something I would have ordered just by reading the description. Once again though, I think they’re a little expensive. Anyone can replicate this dish at home (unlike some of the other dishes here), so while delicious, I’m unclear as to why it’s so expensive at $13. Churrasco – I very much enjoyed this entree that I shared with my wife. I’d never had braised skirt steak before (only grilled) and I was surprised by how tender it was and full of flavor. I liked that it was something different using a piece of meat that is so often grilled. 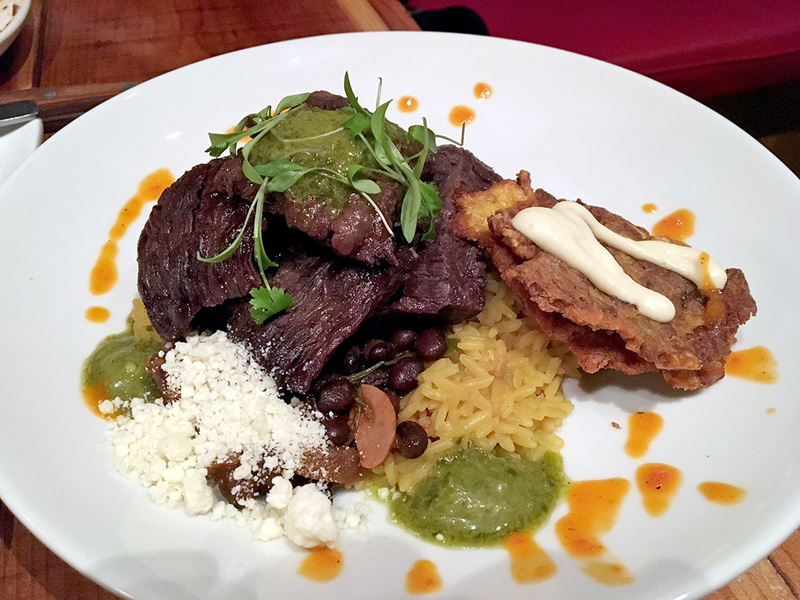 As an accompaniment, the black beans, rice, and patacones (tostones) all had some very nice flavor as well that complemented the skirt steak. This felt like a very home-style comfort food dish to me that someone’s mother might make at home. With that said, I remember looking at my wife and saying, “See? I’d pay $18 for this dish. It’s very good!” That’s when she looked at me and said, “Except that it’s $22.” That conversation sums up some of the problem I had with a lot of the experience all night (i.e. everything was good, but surprisingly pricey). 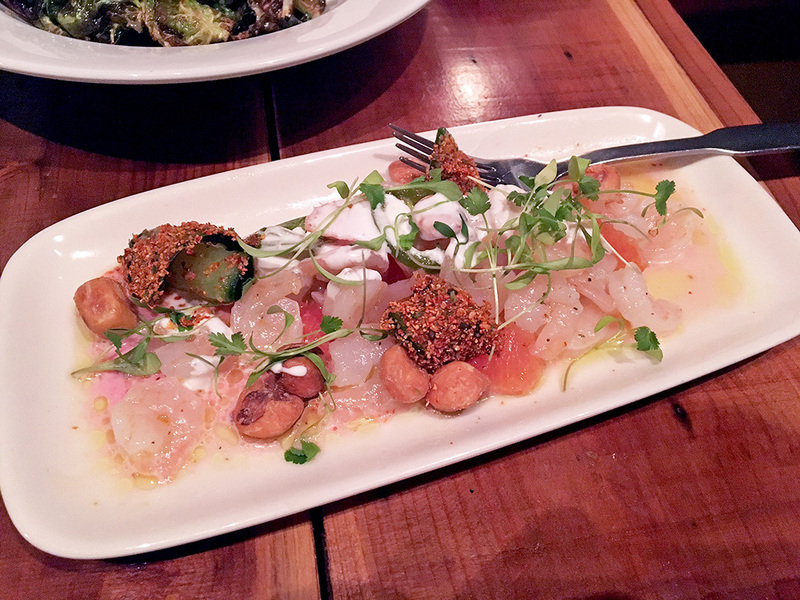 Simply put, Red Fin Crudo offers good food and service, but with a hefty price tag for what you get. The atmosphere and wait staff are great and while the food is better than average, it’s not so good that I’d return to pay the price of most of the dishes. I’d recommend Red Fin to anyone looking for a new dining experience in Providence with a good atmosphere, but with the disclaimer that there are better meals to be had for the same price or less elsewhere. That’s a shame because I could see myself frequenting Red Fin Crudo + Kitchen more often under other circumstances. I am more than sure, however, that they have a loyal customer base and are doing very well as demonstrated by the multitude of rave reviews, so as always, this is just one opinion and it’s worth trying it to decide for yourself.